I’ve been following The Wild Beer Co. for some years now, and not just because it’s based in my childhood home of Somerset*, or because it picked up early on those fascinating printed bottles. It’s because it was the first British new-wave craft brewery to specialise in, as the name implies, wild yeasts. That means bugs like Brettanomyces (Brett to its friends), Pediococcus, Lactobacillus and a number of others. As we’re now discovering, thanks to the diligent work of historians, these were incredibly important right up to the 1800s – Brett in particular was how Stock Ales and vatted Porters were aged. However, while they’re still very important in traditional Belgian brewing, they fell out of favour in most other places, typically with tastes changing to prefer fresher (Mild) beers. Part of this is because they can ferment things that regular Saccharomyces beer yeasts cannot, such as complex sugars and carbohydrates. The downside for the brewer is that they are slow-burners, hence their use in beers that are matured in vats or foeders over many months or even years. “Brett will just keep going – in a barrel it’ll even ferment the cellulose in the wood,” Andrew exclaims. This can cause problems for the brewer, such as if a yeast kicks back into life unexpectedly. For example, both Harvey’s with its initial 1999 brew of Imperial Extra Double Stout and Goose Island with its 2015 Bourbon County Stout suffered from an extra wild fermentation starting months after the beer had been bottled. In Harvey’s case it meant corks being forced out, while for BCS it meant sour notes, “gushing”, and the less-than-popular decision to pasteurise future BCS editions. The bigger worry though is if the wild yeasts escape and go where they’re not wanted. Says Andrew, “We understand Brett, we respect it, and we clean a lot! In four years we’ve never had any cross-contamination on the bottling line, it’s three years since we had any on the kegging line.” He adds that they also have two complete sets of hoses for moving beer around, one for sours and one for normies. 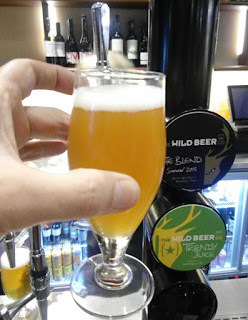 Which reminds me that, while three of the beers on show that evening were mostly sours and wilds, Wild Beer also does whole range of slightly more conventional brews: IPAs, stouts and so on – our 4th was their beautifully complex and fruity Trendy Juice IPA. What of the remaining three beers? All were good, but my least favourite was Black & Blue, their collaboration with New Zealand’s 8 Wired for the 2016 International Rainbow Project. It was interesting, especially in its use of peppercorns, bourbon barrels and zero hops, but too sweet for my liking. Rather better was the 2016 Summer Blend. Inspired by Belgian Gueuze, this sees several of their barrel-aged beers of different ages blended together to produce a fascinating dry-sweet and sour beer, with a mouth-puckering lemony tartness and a complex mix of honey and fruit notes. 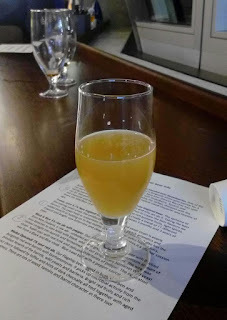 The best for me though was the very last keg of their Amuse Gooseberry, a Lambic-styled beer fermented in this case with gooseberries and aged in white wine barrels. Tart and lightly fruity with lemony and berry notes, it was delicious. An interesting and enjoyable evening then - it certainly broadened my knowledge of wild yeast, and helped me make useful connections between some other stuff I’d already learnt. My thanks to Andrew Cooper for speaking so well and handling all the questions with aplomb and good humour! *Although the brewery is quite a long way over from where I did my growing-up. **I'm sure he gets fed up with the nominative determinism jokes. ***Brewdog is doing something similar, incidentally, building a whole separate brewery for its sours.